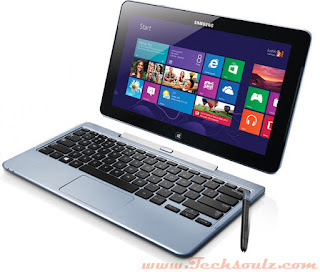 The Samsung ATIV Smart PC Pro, simply put, is an Ultrabook that comes in the form of a tablet. It has an 11.6-inch Full HD display and runs on Intel Core i5 power. It does subscribe to a similar concept as ASUS’s Transformer Android tablets which employ detachable keyboard docks that enhance functionality. Samsung’s keyboard, however, does not feature an extra battery. The good thing about this form factor, however, is that it allows users to just pick up the tablet and leave the additional heft behind when they don’t need it. Conversion is also done quickly and painlessly, and when put together, the portions attach securely. We were satisfied by the unit’s build quality as a whole; its Gorilla Glass screen protection lends much confidence for its often-touched display. We have major reservations, however, about its plastic back plate. Icons and text in 1920 x 1080 resolution on an 11.6-inch screen may appear small, but this display does wonders with high-definition multimedia. At 400 nits, it’s also bright enough to be used comfortably in well-lit areas, while its IPS panel allows wide angles of viewing. To complement the visuals, two 0.8W speakers are set at opposite edges of the tablet. We found the speakers capable of fairly loud, clear quality audio that is more than adequate for personal usage. On our PCMark 7 and 3DMark 11 test runs, the ATIV Pro scored slightly lower than its Windows 8-based peers (4021 and 1035, respectively), although given that it sports the same set of standard Ultrabook components, most users wouldn’t be able to feel any performance shortcomings in actual use, unless of course you literally hold out a stop watch to time some tasks to compare with those of other machines. The ATIV Pro made up with battery life though, ranking tops on Powermark with a 296-minute run. Be wary, though, that the keyboard dock has its own power draw.